Simbal (or Shimbal) is a quiet and peaceful village in the north of Peru, located about 28 km NE of Trujillo, the capital of the Department of La Libertad. On of the attractions of the pretty village square are the murals that have recently been painted on one of the walls facing the plaza. Those paintings represent the tourist attractions of the area which include depictions of the waterfall of Chachit but also of two boulders that are locally well-known because of the prehistoric petroglyphs they bear. Although there is little further information available about this ancient rock art, there is one local who is very well informed about these ancient petroglyphs. In 2012 my wife Elles and I met Mr. Hever Vargas Pando, resident of Simbal, who was so kind to show us a number of fine photographs from his private collection. After our visit to his office he expertly guided us to two rock art sites (Chachit and Lúcumar) that are located in the direct vicinity of the village. 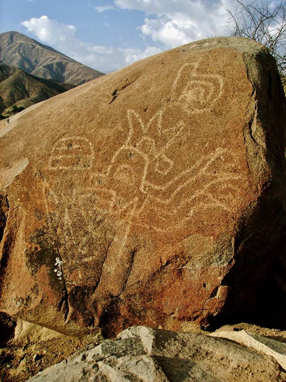 The reason to visit this specific area of the Río Moche drainage (also known as Valle de Santa Catalina) was an interesting publication by the Peruvian archaeologist Daniel Seuart Castillo Benites (2008/2009) in which he described the two rock art sites that were known at that moment. These two sites are identified by him as Chachit (locally better known as the Piedra de Sol) and Río Lúcumar. Since that publication at least three, possibly four, other rock art sites have been reported in the same area (ignoring possible hear-say recordings). A fourth ‘new’ site concerns the documentation of a (possible rock art?) site called Piedra Huequeada de Mucha by Ana María Rocchietti (2012: 6). As her paper gives no further information, this site will not be discussed here. The recently recorded prehistoric rock paintings at El Nagro, Paranday will also not be discussed here (Castillo Benites 2013). This paper will review all five petroglyph sites of the Simbal area that are known at the moment, starting with the previously recorded sites: Chachit and (Río) Lúcumar. This isolated stone, the Piedra de Sol, is located only 1.6 km east of Simbal village square, on the north bank of the valley of the Río La Cuesta (part of the drainage of the Río Moche) near the hamlet of Chachit or Chacchit. When using the UTM co-ordinates provided by Castillo Benites (2008/2009) in Google Earth one will reach a spot that is in reality 2 km distant from the actual location. The stone is located only 40 m due north of the dirt track from Simbal, on an SE facing slope of the hill and at an altitude of 700 m O.D. ; only 20 m above the valley floor of the Río La Cuesta. It probably was the first petroglyph to have been recorded in the Simbal area, as this stone has been described and illustrated in a publication by Hans Dieter Disselhoff as early as 1955 (1955: 64). Subsequently the site has been described by Rogger Ravines (1986), Jorge Zevallos Quiñónez (1990), Daniel Castillo Benites (2008/2009) and has been listed as ‘Simbal’ by Rainer Hostnig in his Inventorio Nacional (2003: 211) who also includes the drawing made by Zevallos Quiñónez (1990: 11; Fig. 13). Rocchietti included this site in a list in her publication (2012: 6) but she did not describe it any further. The name Piedra del Sol probably is based on its orientation towards the rising sun (Rupestreweb Mensajes: Está con dirección hacia donde nace la estrella todas las mañanas. ), but this may be just a speculation. Indeed, the rather flat, triangular boulder faces upwards and east; not south and thus not directly towards the river as stated by Castillo Benites (2008/2009). An attempt to move the stone to Trujillo failed (Rupestreweb Mensajes) because it proved to be too deeply buried in the ground. At the time of our survey (2012) the ancient petroglyph was hardly visible, being weathered considerably. It features a large circular image of an anthropomorphic head with facial features (Figure 1). Because of the eccentric pupils in both eyes the image is ascribed to the Chavín Period (800 to 200 B.C.) 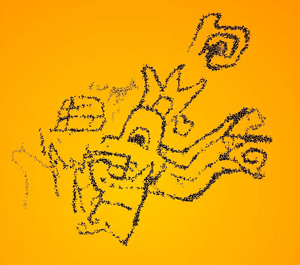 or the Late Formative Period by Castillo Benites (2008/2009), but I for one refute any Chavín influence (Van Hoek 2011) and rather assign this type of petroglyph to a local group of the Cupisnique culture (2000 to 500 B.C.) that once dominated the north coast of Peru. Around the head are some smaller circular and spiral-like petroglyphs that are almost invisible at the moment. based on the illustration by Zevallos Quiñónez (1990: Fig. 13). I first learned of this petroglyph site in 2009 when I found a photograph on the internet (web site no longer available) with a text which read: Los petroglifos de Simbal. Cruzando el Río Lucumar y frente a los linderos del caserío de Cajamarca, un simbalero, hace 3.500 años, nos ha dejado el testimonio de su arte (date and author unknown to me). Interestingly, the 2009-text referred to other rock art sites in this valley and therefore I will return to this text further on. The site is not mentioned in the Inventario Nacional by Rainer Hostnig (2003). Later, I found the publication by Castillo Benites (2008/2009) on the internet (not offering the illustrations; these were forwarded by him to the general public via the internet much later, in 2013). This site, or rather one specific group of panels at this site (labelled LUC-004 by me), has also comprehensively been analysed by Ana María Rocchietti. In her paper she called this site El Petroglifo de Simbal (2012: 10), which is probably the same site as the site called by her Petroglifos del sector de Cajamarca (2012: 6), as the site is found opposite the hamlet of Cajamarca. She provides the following co-ordinates for this LUC-004: S 7º - 58′ - 06″ and W 78º - 48′ - 53″. However, in Google Earth these data lead you to a spot 800 m south of the factual location. When visiting Simbal in 2012, Mr. Hever Vargas Pando was so kind to guide us to this site. At that occasion he told us that he had discovered this site in 1974 (we may have misunderstood him, because later I found a web page in which Carlos Abbate informs the reader that he discovered the site on the 27th of July 1964). 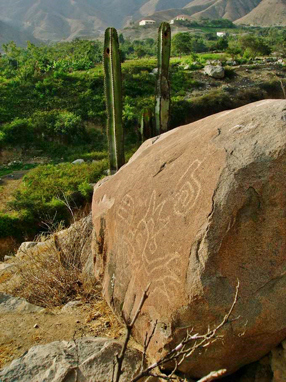 The rock art site is found 1.7 km north of the village square of Simbal and thus is located in the valley of the Río Sinsicap; the northern tributary of the Río Moche. At this spot the river is locally known as Río Lúcumar, named after the lúcuma fruit-trees that grow on the valley floor (which is at 600 m O.D.). The rock art site is found on an extremely steep and gravely NE facing slope of Cerro San Isidro, also known as Cerro Avendaño, which forms the west side of the valley. At this section of the valley the east side is much disturbed by roads, tracks, small villages and mines. The largely undisturbed west side can be reached from the hamlet of (Nuevo) Cajamarca by crossing the arable land (using narrow paths and a tunnel through the sugar cane) and the Río Lúcumar, while the rock art site can be reached - after touching the foot of the hill - by first following a steep path to the NW. Then, at a certain point, the narrow path sharply turns to the south and one has to climb the steep path which actually is an almost vertical, gravely slope, until, turning SE again, the path levels out and leads to the main rock (LUC-004) at the highest point of the path (at about 640 m). This section of the steep hill side is littered with gravel and with small and large boulders and several outcrops. The petroglyph art is found at several spots on the shill side and at different altitudes in a line roughly running NW - SE. Because of the mix of loose boulders and fixed outcrops at this site the factual number of boulders/panels is rather confusing. Castillo Benites mentions ‘six rocks or panels’ (seis soportes) with petroglyphs at Lúcumar, although he actually illustrates 13 panels (2008/2009: Láminas 4 to 12). Rocchietti (2012), who only discusses the LUC-004 complex, claims that two the two rocks that she describes (Bloque Mayor and Bloque Menor, respectively comprising the following panels: LUC-004ABCDEF and LUC-004G) are actually part of one and the same outcrop and therefore I follow her claim. Having said all this, it is surprising to see that in fact there are ten boulders/outcrops at this site with altogether 16 panels; three of which (LUC-001, LUC-003 and LUC-004F) have not been described by Castillo Benites. LUC-001. This isolated boulder (not listed by Castillo Benites) is located on the horizontal valley floor (at 600 m O.D.) a short distance east of the foot of the hill. It seems to have been moved or displaced. Its smooth upper surface has one clearly pecked straight groove that is connected to a shorter straight groove ending in a curl. There are other minor markings that may be anthropic. LUC-002. This boulder has been listed by Castillo Benites (2008/2009: Fig. 10; however, his drawing should be rotated 180 degrees). It is located on an old river terrace at the very foot of the hill (at about 605 m O.D.). The stone is located just east of a high cliff that in wet times will have a small but high waterfall. Below this cliff is an area with a jumble of small and large boulders, one of which is LUC-002. Its east facing and steeply sloping, smooth surface has a complex abstract design. LUC-003. From Boulder LUC-002 a small and narrow path (most likely a very ancient path) steeply leads NW and then turns south and precipitously uphill. In this almost vertical section of the path and directly bordering the path on its south side is a large outcrop area (at about 630 m O.D.) with a smooth, sloping rock panel that faces NW and upwards. Its much fractured surface has two areas with pecked grooves. One area has a grid of five grooves; further SW is one single groove. This panel has not been listed by Castillo Benites. It shows faint scratching by (local?) vandals. LUC-004 probably is a large projecting outcrop rock, located at about 640 m O.D., and directly east of the path that more or less terminates here. The rock more or less overhangs the almost vertical hill slope. This is the major petroglyph rock with altogether seven panels (LUC-004A to G) that are decorated. Panel A is the large, fractured but flat panel that faces and steeply slopes west. It has been described and illustrated by Castillo Benites in seven Sectors (2008/2009: Lámina 5 - Sectores 1 to 7). Panel B is the south facing and more rough surface of the rock and the two petroglyphs on this panel have been illustrated by Castillo Benites as Sector 11 (2008/2009: Lámina 5 - Sector 11). Panels LUC-004C, D and E have been described and illustrated by Castillo Benites in three Sectors (2008/2009: Lámina 5 - Sectores 8 to 10). The even smaller Panel LUC-004F (almost touching LUC-004E) has faint petroglyphs and a very clear design that may represent a (re-pecked?) prehistoric petroglyph or even recent graffiti. The other side of this small rock has been vandalised by scratching. It has not been illustrated by Castillo Benites. Panel LUC-004G is a horizontal rock panel directly to the south of Panel LUC-004B. 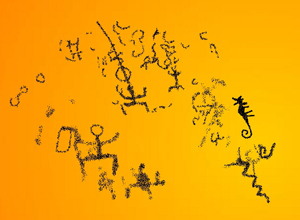 The petroglyphs have been illustrated by Castillo Benites (2008/2009: Lámina 6; although his drawing is incomplete). Rocchietti (2012) fully describes this rock, but omits panel LUC-004E. LUC-005 is a fragmented part of the almost vertical rock outcrop opposite (west of) LUC-004 and directly west of the path. The petroglyph has been illustrated by Castillo Benites (2008/2009: Lámina 11). LUC-006 is another large part of the same vertical rock outcrop west of LUC-004 and also directly west of the path. 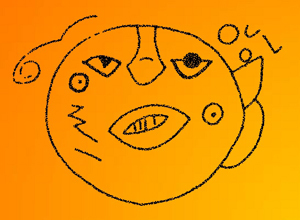 The petroglyph has been illustrated by Castillo Benites (2008/2009: Lámina 8), but his drawing of this large ‘head’ petroglyph is inaccurate. Strangely, Rocchietti (2012: 13; Fig. 13) states that this panel is part of LUC-004, while it is certain that it is found on a different outcrop altogether: Esta superficie contiene un bello signo que podría interpretarse como rostro humano (Fig. 13). Figura 13: Bloque Mayor, Superficie gráfica B. Posible rostro humano. LUC-007 is a large rock a short distance to the SE of LUC-004 and at a lower level (approximately at 635 m O.D.). The design has been illustrated - slightly distorted - by Castillo Benites (2008/2009: Lámina 12). LUC-008 is another large rock SE of LUC-007 at a slightly lower level. Unfortunately, a large part of the smooth upper surface has severely been vandalised with letters and scratching. The petroglyphs (fortunately undamaged), have been illustrated by Castillo Benites (2008/2009: Lámina 4) and include two curvilinear MSC-Style images (Figures 2 and 3). The MSC-Style is an acronym introduced by me (Van Hoek 2011: 11) in order to nullify the incorrect and therefore unwanted Chavín label that many (rock art) images in the Andes have received and are still receiving. Also the (few) MSC-Style rock art images in the Simbal area probably have been manufactured by one of the Formative Period cultures (Cupisnique, Guañape, Sechín) during the period of roughly between 2000 B.C. and 500 B.C., and not by Chavín. Further north on the same panel are a rectilinear labyrinth of grooves (possibly also of the Formative Period) and a match-stick figure of an anthropomorph (?) with an outlined circular head without facials. Figure 2. MSC-Style petroglyphs on Boulder LUC-008, Lúcumar, Simbal, Peru. Photograph © by Maarten van Hoek. Figure 3. Possible MSC-Style petroglyphs on Boulder LUC-008, Lúcumar, Simbal, Peru. LUC-009 is a boulder found lower down the slope (at about 630 m) near a faint path that leads to the quebrada further south. In this area, just north of the quebrada, there are many fragments of pottery and some low circular structures; a prehistoric settlement, perhaps? Rocchietti (2012: 11) also mentions the structures in this area: recintos que los arqueólogos acompañantes evaluaron como Chimú. The petroglyphs are as illustrated by Castillo Benites (2008/2009: Lámina 9), but should now be rotated approximately 30 degrees anti-clockwise (the boulder may have been disturbed since the recording by Castillo Benites, as it is located on a very steep slope). LUC-010 is a tilted boulder very near the escarpment and its intermittent waterfall. The petroglyphs have been illustrated by Castillo Benites (2008/2009: Lámina 7), but his drawing does not do justice to especially the unique petroglyph of a bird-zoomorph combination (Figure 4). Another petroglyph above the bird clearly represents a zoomorph and not an amorphous blob. Figure 4. Petroglyphs on Boulder LUC-010, Lúcumar, Simbal, Peru. Photograph (slightly rotated) © by Maarten van Hoek. Interestingly, Castillo Benites (2008/2009), while referring to Disselhoff (1955: 68), relates of two other possible rock art sites in the Simbal region. 1: Se cuenta con las referencias descriptas por Disselhoff en la década del cincuenta. Según relata, había escuchado comentarios acerca de la entrada de una mina de plata abandonada en la que se encontraban varias "figuras". 2: La misma se ubicaría en el trayecto del camino entre Simbal y Sinsicap, pero fue en vano su esfuerzo por localizar el sitio en la parte alta del Valle de Moche. It now seems possible that the first reference indicates a rock art site in the valley of the Río La Cuesta (to which I shall return further on; see Section 4), while the second reference clearly concerns a rock art site in the Sinsicap Valley. 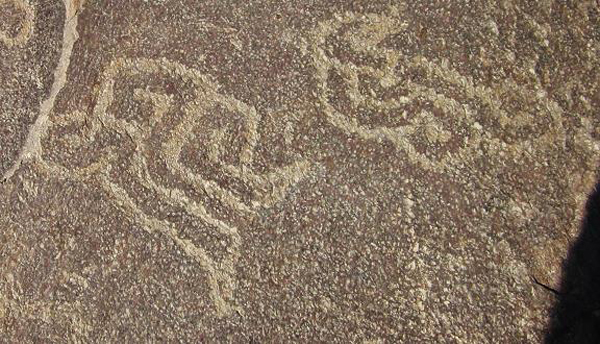 Neither Disselhoff nor Castillo Benites succeeded in recording those two rock art sites. However, in the past years there have been other discoveries of rock art sites in the area that may be related to the hear-say accounts by Disselhoff. The 2009-photograph mentioned above notably had another text which reads: También se encuentran en Cerro Prieto, y en el camino a ñary, así como La Piedra del Sol a La Cuesta, y frente a Collombay. Petroglifos que debemos conocer y conservar como patrimonio. Interestingly, also Rocchietti mentions Petroglifos en camino a Ñary in her short list (2012: 6) but unfortunately she gives no further details. In view of all those suggestions it could be expected that more rock art would be recorded in the Simbal area. Indeed, at least one other rock art site (discussed in Section 3) was found by us in the valley of the river Sinsicap in 2012. Cerro Prieto is the name of a small hill (cerro) 4.8 km north of Simbal and also of a very small hamlet at the east foot of that hill. ñary is a ‘caserío’ some 9 km NNE of Cerro Prieto (actually, the purported rock art site - en el camino a ñary - can be located anywhere between Simbal and ñary). Cerro Prieto is also one of the most densely populated ‘caseríos’ in the Simbal District (apart from Simbal). Collambay is a hamlet 2.5 km NE of Cerro Prieto. Near Collambay is a very large round boulder with, at its bottom, a very large (anthropic?) hole (large enough for an adult to sit in). This boulder might be the site referred to by Rocchietti as the Piedra Huequeada de Mucha (2012: 6). A problem is that a large area of the Sinsicap Valley between Collombay and Simbal is called Cerro Prieto by the locals, who moreover had no idea about the location of any rock art site during our visit. On top of that, the whole area, valley floor and many hill slopes alike, are often littered with (very) large boulders. Despite those difficulties my wife Elles and I managed to find an unpublished (?) rock art site in this area. We named it Cerro Prieto (and labelled the petroglyph boulders CPR), although in the past it may have been reported, or in the future will be reported by a different name. However, I will not reveal the exact location here, in order to avoid damage and vandalism, which is increasing. On the slopes of a rather steep hill are a large number of boulders; many suitable for petroglyph production. At least five of those boulders proved to have petroglyphs, but, except for one fine anthropomorphic figure, all designs are extremely faint. Boulder CPR-001 has a very faint design that cannot be classified. Boulder CPR-002 has a circular design of lines on upward facing Panel A that continue on vertical Panel B, and is possibly connected to a circle and other lines. Boulder CPR-003 has three panels with petroglyphs. West facing and slightly sloping Panel A has a number of abstract motifs (at least one spiral) and lines that are too faint to make out, but also two bird- or tumi-shaped motifs and possibly a small inverted anthropomorph. Vertical Panel B faces east and also has very faint lines that are very hard to read. South facing and vertical Panel C has the best preserved petroglyph. There are three images (Figure 5). The left-hand image is a broad U-shaped element that terminates in one small circle. The right-hand element seems to be a kind of long object (a staff?) with possible facial features at the upper end. It is too much weathered to be sure. The figure in the centre is clearly an anthropomorph. It has a rectangular, outlined head with simple eyes and mouth; a rectangular, lightly pecked body and two straight, match-stick legs that end in fully pecked feet. Between the legs it has a triangular appendage that looks much like a similar appendage (male sexual organs?) of one of the anthropomorphic rock paintings at Quebrada de Higuerón in Chicama (Castillo Benites 2006: Fig. 2). Interestingly, the figure does not seem to have arms (weathered off? ), but still it may be possible that it is ‘holding’ the elements to its left and right (like the Andean Staff-God). Figure 5. Petroglyphs on Panel CPR-003C, Cerro Prieto, Simbal, Peru. Boulder CPR-004 is located directly north of Boulder CPR-003. On its slightly sloping upper surface are the faint remains of a possible ‘head’ petroglyph with dots for facial features and a number of curvilinear designs. The vertical north side might have some faint lines. Boulder CPR-005 is located a short distance from the previous two and its west sloping surface seems to have one image of a (very faint) zoomorph with a curled tail and other, even fainter markings. The village square of Simbal also has a painting of a petroglyph site that is labelled Piedra la Paloma (also called La Piedra de Chacchito de la Paloma locally). 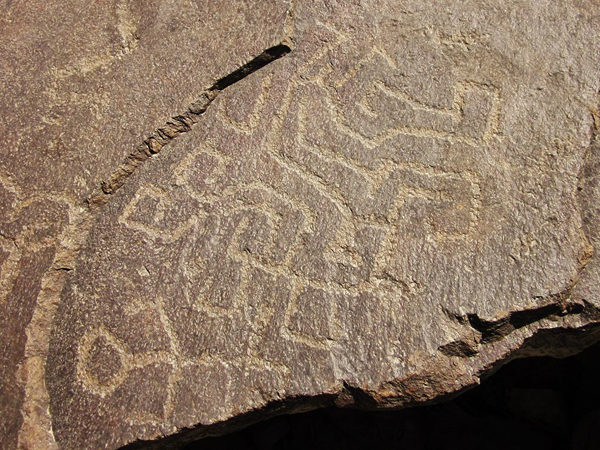 It proved to be the petroglyph that I found earlier on the internet, where two photos of the stone, labelled Simbal - Valle Moche, are shown in a web page of the Proyecto Arqueológico Ventarrón - Collud. I wrote to Dr. Ignacio Alva Meneses, director of the Huaca Ventarrón Archaeological Project in Lambayeque, who was so kind to bring me in contact with Mr. José Carlos Orrillo of Trujillo who told me (2012: pers. comm.) that a friend of him discovered this stone in 1998. He called the stone the Piedra del Aguila or Petroglifo de Simbal, but because of the painting in the village, I prefer to maintain the name Piedra la Paloma, which is also used by Rocchietti (2012: 6). According to Mr. José Carlos Orrillo, who was so kind to send me some fine photographs of the Piedra la Paloma (Figures 6 and 7), this stone is found more or less ‘opposite’ the Piedra del Sol, but on the west bank of the Río La Cuesta. Mr. Carlos Orrillo remarked that both stones are ‘facing each other’. This may be the stone which Disselhoff referred to as: escuchado comentarios acerca de la entrada de una mina de plata abandonada en la que se encontraban varias "figuras", as from this site a track leads south into the mountains to what seems to be a cluster of mines in Google Earth. The vertical west face of the Piedra la Paloma (Figure 8) bears a clear design of a MSC-Style profile head with an eye with an eccentric pupil, a downward curving mouth and a typical row of three triangular appendages on the head that most likely represents some kind of headgear. Emerging from the back of the head is a feature of three parallel bands (one ending in a short spiral) that may represent a (fish?) tail (compare this with a similar petroglyph at Alto de la Guitarra). Hovering over the head is another petroglyph that may represent part of an MSC-Style head, while in front of the head are further lines. There may be some images on top of the stone, but these could not be ascertained. Figure 6. MSC-Style petroglyphs on the Piedra la Paloma, Simbal, Peru. Photograph © by José Carlos Orrillo. Figure 7. MSC-Style petroglyphs on the Piedra la Paloma, Simbal, Peru. Figure 8. MSC-Style petroglyphs on the Piedra la Paloma, Simbal, Peru. Until recently no rock art had been recorded in the valley south of Simbal. However, in the stretch of four km of the river valley between the village of Simbal and the confluence of the Río La Cuesta with the Río Moche, at least one petroglyph boulder has been recorded by an anonymous person who once posted some photographs on the internet. With some trouble I could trace the spot with Google Earth. The petroglyphs appear on one of the many large boulders at the foot of a low ridge. SSW of this site, in Moche, is the rock art site of Menocucho described by Ventura & Quiros (2004). 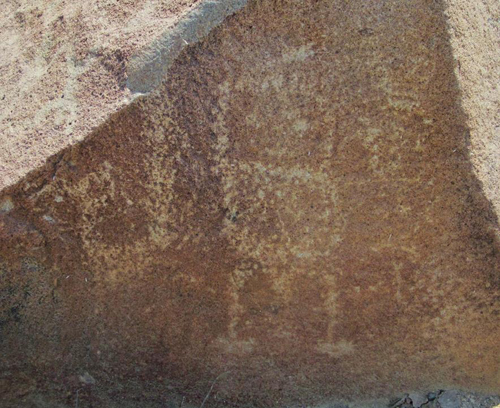 The petroglyphs on the boulder in this section of the Río La Cuesta are much weathered and moreover, the low-res photos that I have show the vertical rock panel in the shade. I estimate the roughly rectangular panel to measure approximately 1.6 m in height and 2 m in width. The panel probably faces SW and has a collection of at least three or four petroglyphs of lizard-shaped or anthropomorphic figures (one with a long groove from the head; probably part of another even less visible set of images); a zigzagging snake-like figure near the right-hand bottom, and at the right-hand edge a distinct, fully pecked zoomorph with long curled-up tail, depicted fully laterally, shown in an unusual position (rotated 95 degrees anti-clockwise), as if it is ‘climbing’ the edge of the panel. Just below this zoomorph is a motif that seems to represent the tail of a similar animal. It is possible that the rest of this petroglyph was once visible on the adjoining south or SE sloping panel. Unfortunately, this adjacent panel shows much weathering (superficial exfoliation) and the remainder of this petroglyph (and possibly others) may have flaked off. The drawing below (Figure 9) is only a rough sketch and certainly needs improvement. Figure 9. Petroglyphs on a boulder near the Río La Cuesta, south of Simbal, Peru. Drawing © by Maarten van Hoek, based on a photograph by an unknown author. This rough sketch may include errors and markings that may be natural. 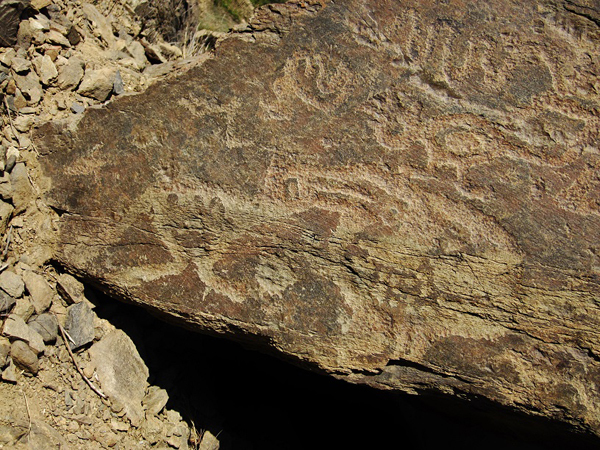 It is not at all unexpected that new rock art sites are being discovered in the Andes. This chain of high mountains and dry coastal deserts has a long history of emerging and declining cultures that all left their marks; also on the rocks. The area around Simbal is no exception. Therefore, also the rock art repertoire around Simbal will reflect the influence of those cultures. However, it is very difficult to assign individual rock art images to a specific culture. Notably, the Moche drainage, especially the large coastal plain, has been inhabited by many cultures since the Pre-Ceramic Period (which started around 9000 B.C.). It was followed by the Formative Period (around 2000 B.C. ), which is characterised by the introduction of pottery. One of the best known Late Pre-Ceramic Period structures in the area is Huaca Prieta, which is located near the mouth of the Río Chicama, further north. After that, the area became the heartland of the Cupisnique cultures that are well known for their characteristic pottery and their temple complexes, like Caballo Muerto, east of Trujillo. The Cupisnique were followed by the Salinar culture which ultimately transformed into the well known Moche civilisation. A most important Moche temple complex is Huaca de la Luna near Trujillo, where many impressive Moche friezes have been excavated. Later, the kingdom of Chimú, often called Chimór, ruled the area from their adobe capital Chan Chan, just NW of Trujillo, until it was conquered by the Incas and, later still, by the Spanish conquistadores. It is certain that also the rock art production in the Simbal area started as early as the Formative Period in which the Cupisnique culture emerged and flourished. At least three petroglyphs definitely display Cupisnique influences, notably the two MSC-Style images on LUC-008 and the large petroglyph on the Piedra la Paloma. Also the image on the Piedra del Sol may be of Cupisnique manufacture. Castillo Benites ascribes the images on LUC-010 to the Moche culture. This may be correct, but I prefer to address this issue more carefully and allow for other cultures, like Salinar or Chimú, to be responsible for those petroglyphs as well. Rocchietti also makes some interesting statements regarding dating: En rigor no existen signos totalmente propios o exclusivos de los cazadores-recolectores-pescadores (6000 - 3000 B.C.) ni tampoco de los agro-pastores; … no posee tampoco los seres humanos (o mitológicos) completos, con tocados o con vestidos (2012: 14); Tampoco está el mítico Aiapaec de los Moche (2012: 15). However, she bases all those remarks upon an incomplete survey of only the Lúcumar site. Most likely she was not aware of the Formative Period imagery on Boulder LUC-008 and on the Piedra la Paloma. Also the probably Early Intermediate Period imagery on many of the others stones in the Simbal area was unknown to her. In conclusion, all we can be sure of is that the rock art near Simbal dates from the Formative Period to the Late Intermediate Period. What is also certain is that the valuable legacy of the ancient Andeans in this area merits careful preservation, as is strongly advocated by Rocchietti (2012). This update could never have been written without the kind assistance of Mr. Hever Vargas Pando of Simbal who enthusiastically guided us to Chachit and Lúcumar. We are also grateful to him for showing us his collection of photographs and for additional information. I am indebted to Dr. Ignacio Alva Meneses, director of the Huaca Ventarrón Archaeological Project in Lambayeque for his help in tracing the origin of two photos of the Piedra la Paloma in the web site of the Huaca Ventarrón Archaeological Project and especially to Mr. José Carlos Orrillo who has been so kind to share photographs and information with me about this rock art site. Two of his photos (Figures 6 and 7) have been included in this paper with his kind permission. We are also grateful for all the local people who helped us on our way and for permission to enter their properties. Last but not least I thank my wife Elles for her ongoing support, in the field and at home. van Hoek, Maarten. An update of the petroglyph art near Simbal, Río Moche, North Perú. Castillo Benites, D. S. 2013. Identifican 40 pinturas rupestres en la localidad de Paranday. In: Lista Arqueologia Peruana. -2008/2009. Petroglifos del Distrito de Simbal, valle de Moche. Lista Arqueología en DePeru.com. En: Revista Museo de Arqueología Universidad Nacional de Trujillo No. 11; pp. 145 - 158. Trujillo. Disselhoff, H. D. 1955. Neue Fundplätze Peruanischer Felsbilder. In: Bässler-Archiv, Volume III; pp. 55 - 73. Berlin, Germany. Ravines, R. 1986. Arte Rupestre del Perú. Inventario General. Instituto Nacional de Cultura Lima Perú. Rocchietti, A. M. 2012. El Pájaro de Simbal (Valle de Moche, Perú). AИTI - Revista del Centro de Investigaciones Precolombinas; Núm. 11; pp 5 - 14. Buenos Aires, Argentina. Romero Marines, A. 2012. Tour Simbal. Recursos Arqueológicos y Recursos Turísticos. Information on the internet: Tu Pekeña Travieza. Ventura, R. & Quiros, L. 2004. Petroglifos de Menocucho: un nuevo sitio rupestre en el valle de Moche. Boletín SIARB. Vol. No 18; pp. 31 - 39. La Paz. Van Hoek, M. 2011. The Chavín Controversy - Rock Art from the Andean Formative period. Privately Published using the BLURB Creative Publishing Service. Oisterwijk, The Netherlands. Zevallos Quiñónez, J. 1990. Petroglifos de la zona costera de Trujillo. In: Revista del Museo de Arqueología Universidad Nacional de Trujillo. Vol. Nº 1; pp. 7 - 23. Trujillo. En relación al trabajo de van Hoek, Maarten. An update of the petroglyph art near Simbal, Río Moche, Norh Perú, publicado en Rupestreweb, http://www.rupestreweb.info/simbalpetroglyphart.html 2014, me veo en la obligación moral de contestar al menos algunas de las afirmaciones que presenta y formular sugerencias que contribuyan a un avance cuali-cuantitativo en las investigaciones del arte rupestre peruano. El artículo mencionado basa su aporte en la crítica de dos trabajos, uno de mi autoría (Castillo: 2008/09) y el otro de A.M. Rocchietti (2012). En primer lugar deseo destacar que ambos investigadores hicimos nuestro aporte desde una gran idoneidad, experiencia de campo y formación en la especialidad, es más, cuando apareció el artículo de la Dra. Rocchietti comprendí que no tuvo acceso a mi trabajo y lo adjudiqué a un desliz del equipo que la acompaña, es decir, que por sobre todo disfruté del texto y de reconocer la fuerza que imprime a todas las actividades que promueve en el Perú. En segundo término y limitándome a lo nodal de las críticas que formula van Hoek, diré que es risible la presentación de discrepancias entre las coordenadas que brindamos para los sitios “La Piedra del Sol” (Castillo) y Lucumar (Rocchietti) con relación al Google Earth, cuando el autor ni siquiera hace un intento para los hallazgos que realiza y describe en Cerro Prieto, para “evitar daños o vandalismo”, lo que constituye al menos una ingenuidad de su parte, y además pone de manifiesto la ausencia de trabajo y gestión con las comunidades locales para evitar que tales eventos pudieran ocurrir. Respecto al petroglifo “La Piedra del Sol”, en ningún punto del artículo tratado lo adscribo al “período Chavín” como afirma van Hoek, y de hecho lo refiero al formativo tardío. Asimismo, el neologismo “MSC-Style” que le pertenece y sigue en sus publicaciones, es un concepto que afirma estar dirigido a “anular la incorrecta y consecuentemente no deseada etiqueta Chavin”. Por mi parte sostengo que se trata del reemplazo de una etiqueta por otra y que además está mal definida. La literatura en metodología arqueológica es riquísima en trabajos sobre la definición de estilos, fases, facies y demás unidades integrativas, y aún como hipótesis de trabajo, integrar en un solo estilo las producciones Manchay, Sechín y Cupisnique constituye una simplificación extrema que no merece mayores comentarios. Por otra parte, llama la atención que el autor publique un dibujo del petroglifo Piedra del Sol realizado sobre una ilustración de Zevallos Quiñónez, ya que visitó el sitio, describió los motivos y de seguro pudo brindarnos una versión mejorada con los equipos fotográficos que usó para mostrarnos, por ejemplo, el detalle de un petroglifo de Cerro Prieto. En cuanto a Lucumar, cabe destacar que la publicación completa estuvo a disposición del público en 2009 (Revista del Museo de Arqueología, Antropología e Historia - Trujillo), y lo que el autor refiere sobre los hallazgos que realizó en Internet (2008/2009 y 2013) corren por su cuenta, la información estuvo disponible desde la fecha de edición mencionada. En arqueología, y por consiguiente en arte rupestre, las técnicas de registro y documentación se eligen o adaptan a la características que los sitios presentan, quizás la falta de formación en esta disciplina condujo al autor citado a encontrar confusa la presentación del sitio en soportes y paneles, una técnica por demás aceptada y aplicada, al igual que el empleo del microscopio en el trabajo de campo, la guía Munsell de colores, y otras herramientas de trabajo que nos permiten realizar estudios de técnicas de ejecución, pátina y demás, las que en algunas oportunidades conducen al descarte de motivos y/o soportes que corresponden a “trabajos modernos”. En este caso en particular, me acompañaron y estuvieron a cargo de los estudios mencionados, la Lic. María Susana Barrau (Universidad de Buenos Aires) y el Lic. Ilder Cruz (Universidad de Trujillo). Cada aporte al conocimiento de un sitio arqueológico es una invitación a revisar la evidencia reunida, y dado que recorremos en forma periódica los sitios registrados y documentados, a fin de verificar aspectos relativos al estado de conservación e implementación de planes de gestión, aprovecharemos la próxima ocasión para realizar observaciones adicionales. Por otra parte, también contrastaremos nuestros archivos con el material editado, porque es real que en ocasiones se invierten las ilustraciones o deslizan errores que pueden fácilmente subsanarse. De todas formas deseo dejar en claro que cuando un estudioso se refiere al trabajo de otros profesionales en los términos en que van Hoek lo hace, lo mínimo requerido desde la ética y hasta del sentido común, es proveer al lector de los elementos de juicio necesarios para que pueda formar su opinión al respecto. Es obvio que las afirmaciones sobre lo que la Dra. Rocchietti y yo conocemos y manejamos sobre el tema que nos ocupa, caen en un ámbito mágico-religioso, y en este sentido el autor se arroga facultades divinas. Ahora bien, cuando se refiere a dibujos completos, sin distorsiones de cualquier tipo y que hagan justicia a las evidencias que sostiene haber registrado y documentado, es lógico esperar que muestre su aporte más allá de las palabras, con dibujos y fotografías que sustenten sus dichos, más aún cuando el artículo reseñado es una edición electrónica, de tal forma que es ridículo pensar que sufrió limitaciones de espacio, tan comunes en obras y publicaciones periódicas. En síntesis, este proceder sólo arroja un manto de duda acerca de la intencionalidad detrás de las observaciones realizadas, y citamos algunos ejemplos haciendo la salvedad que el artículo no está paginado: “su dibujo debe rotarse 180°” -“su dibujo es incompleto”- “su dibujo de este amplio ‘head’ petroglifo es inexacto” -“ligeramente distorsionado”- “pero debe rotarse aproximadamente 30° en el sentido contrario a las agujas del reloj” -“este dibujo no hace justicia al especialmente único petroglifo con una combinación ornito-zoomorfa. Otro petroglifo encima del pájaro claramente representa a un zoomorfo y no a una mancha amorfa”. En este contexto, nos sorprende en primer lugar al reportar los soportes de Cerro Prieto con una detallada descripción de los motivos grabados, y omitiendo la presentación de los dibujos respectivos, y en segundo lugar, que decida informar sobre los petroglifos de Piedra la Paloma y Río La Cuesta, ya que los datos que brinda son de segunda mano y emplea fotografías de terceros, de tal forma que presenta dibujos realizados a partir de esas imágenes, e incluso en el segundo caso, agrega apreciaciones sobre la ubicación del sitio realizadas a través del Google Earth, y se vale de fotografías para estimar las dimensiones y probable orientación geográfica del soporte. Es de lamentar que esta información tan válida para programar una salida al campo con la finalidad de registrar y documentar tales expresiones, se incluyera en un artículo de revisión del trabajo de otros investigadores, ya que sin lugar a dudas este proceder no se condice con un abordaje científico de la materia. En la conclusión del trabajo, el autor reseñado alude a la dificultad en asignar las imágenes del arte rupestre a una cultura específica, y nosotros ampliamos el concepto, y sostenemos que es una tarea imposible para aquellos que desconocen los contextos arqueológicos respectivos, y muy especialmente la iconografía predominante en las sociedades que nos precedieron, en este caso, en la ocupación del valle de Moche. van Hoek sostiene “Castillo adscribe los motivos de LUC-010 a la cultura Moche. Esto puede ser correcto, pero prefiero manejar este asunto más cuidadosamente y asentar que otras culturas, como Salinar o Chimú, también pueden ser responsables por esos petroglifos”. De nuevo enfrentamos apreciaciones sin una base argumentativa sólida, ya que la vía correcta pasa por el análisis, evaluación, aceptación o rechazo de la información brindada en el texto. Por último y citamos: “En conclusión, de lo que podemos estar seguros es de que el arte rupestre en las inmediaciones de Simbal data desde el período formativo al período intermedio tardío”, afirmación que de nuevo nos sorprende, ya que pasa por alto la información que brindo acerca de la representación de la flor de la cantuta, motivo ampliamente difundido en el ámbito incaico, un dato que complementamos con noticias etnohistóricas. En síntesis, el arte rupestre que estudiamos es sólo una pequeña porción del testimonio material de los grupos humanos que construyeron sociedades y espacios a lo largo de la costa norte peruana. En tal sentido, el abordaje es siempre desde la arqueología, con las técnicas de registro y documentación desarrolladas a tal fin, y con un conocimiento profundo de los contextos arqueológicos y paisajísticos asociados. En los últimos 10 años se multiplicaron las investigaciones sistemáticas del arte rupestre de la zona tratada, con el aporte de científicos que trabajan con técnicas y metodologías cada vez más refinadas y enriquecidas a través de la participación en congresos nacionales e internacionales, que proveen ámbitos magníficos para la transmisión e intercambio de conocimientos. En definitiva, esta es mi manera de decir que la opción seria y viable es construir desde la ciencia arqueológica, y que ya no caben reportes sobre la base de fotografías, datos e incluso informes completos que se obtienen “en donación” por parte de terceros, sin la debida confirmación de los datos en el terreno, como así tampoco aplica el recurso de enviar a guías locales con cámaras fotográficas a recorrer sitios, o acosar por mail a investigadores, universidades, o editores reclamando información inédita, que está en prensa o en proceso de elaboración. Las últimas palabras las dedico a agradecer a la Dra. Rocchietti por su incansable labor en el Perú y Argentina, trabajos imposibles de resumir en estas líneas, pero que construyen un puente de conocimiento y un lazo que nos une también en el afecto. Sostener como afirma van Hoek que la Dra. Rocchietti desconoce la iconografía del formativo o del período intermedio temprano, es una herejía que no merece mayor comentario. Primero: Mi artículo sobre Simbal que he publicado en Rupestreweb (2014) es exactamente lo que dice en el título: una actualización. Una actualización reexamina las fuentes disponibles y -cuando es necesario- reajusta los resultados; basando todas las correcciones en las investigaciones en el campo. Nunca fue mi intención ofrecer un inventario completo ni científico, ni presentar en detalle un texto y una descripción gráfica completa (con fotografías y/o dibujos de todos los soportes). También es demasiado fácil de Castillo decir que su publicación completa de Simbal (2009) estuvo a disposición del público en el año 2009. El año de publicación no significa que la publicación este a disposición del público en todo el mundo inmediatamente. Quizas por este razón Castillo publicó su 2009-trabajo, pero sólo el texto - sin ilustraciones, en el internet al 15 de junio 2010 (http://lista-arqueologia.de peru.com/2010/06/arqueologia-petroglifos-del-distrito-de.html). Sin embargo, Castillo distribuyó las illustraciones de su trabajo (Anexos) como archivo adjunto (PDF) en un correo electrónico mucho más tarde, en 2013. Para mí, es totalmente irrelevante si alguien tiene un título académico o no, tiene una gran experiencia o no. Lo único que importa (para mi) es el resultado; lo que se ha publicado (en papel o electrónicamente). Este resultado (el artículo: texto y los dibujos correspondientes) puede ser leído y comentado por lectores críticos. Invito a todos los lectores de Rupestreweb a leer mi trabajo (agradezco a Castillo por compartir una traducción en Español con los lectores de Rupestreweb) y juzgar si he escrito algo incorrecto. Entretanto, hay un artículo de Castillo (2009) con un poco de información incorrecta. Anticipo que una publicación científica ofrezca la información correcta, pero demostró que el artículo de Castillo (2009) no era exacto en cuanto a algunos asuntos. Consecuentemente, a veces me parece necesario hacer correcciones en el texto y/o en las ilustraciones. Para mi no importa quién hace las correcciones. ¿Quién me impide de corregir algo? Castillo tendría que agradecer que alguien hace estas correcciones. La única cosa en que Castillo es correcto es que yo no tengo ninguna formación académica en la arqueología: tengo formación académica en geografía. Sin embargo, en lo que respecta a arte rupestre tengo absolutamente la experiencia en el campo: desde 1975. Y desde 1982 he publicado más de 80 artículos y libros sobre arte rupestre mundial (http://andeanrockart.webklik.nl/page/bibliography). Segundo: Sin embargo, ¿por qué a mi? ¿por qué ahora? ¿por qué Castillo considera sólo mi obra de Simbal (2014) y por qué sólo ahora (después de muchas otras publicaciones de mi parte)? ¿Por qué ahora mi trabajo de Simbal (2014) ofrece un poco de crítica al trabajo de Castillo (2009)? Además, muchos investigadores de arte rupestre utilizan fotos, diapositivas y dibujos de otros investigadores, sin nunca haber visitado los lugares (unos ejemplos: Núñez Jiménez 1986: 443 - Pampa Calata; Hostnig 2003: muchos sitios; Linares Málaga: muchos sitios etc.). También en estos casos, estos investigadores de arte rupestre nunca han investigado estos sitios in situ, ni la comprensión de la arqueología de estos lugares. Además, algunos de estos investigadores -como yo- no tienen formación académica en la arqueología (pero para mi, no importa). Por lo tanto, es muy extraño que Castillo sólo critique mi trabajo de Simbal (y mi persona). Desde el año 2000 he escrito 38 artículos y libros sobre arte rupestre Andino, publicados en diferentes medios de comunicación (Rupestreweb, Rock Art Research, Boletín de SIARB, etc. Ver: http://andeanrockart.webklik.nl/page/bibliography y nunca Castillo tenía ningún comentario sobre mis publicaciones, tampoco sobre mi trabajo de Tomabal en "su" zona, La Libertad: VAN HOEK, M. 2007. Petroglifos Chavinoides cerca de Tomabal, Valle de Virú, Perú. Boletín de SIARB, Vol. 21, pp 76-88. La Paz, Bolivia. ¿Por qué ahora de repente? ¿Por qué en este caso (Van Hoek 2014) el 2009-artículo de Castillo está un poco corregido? 1) ¿Por qué Castillo ha publicado un trabajo sobre Simbal (2009) en qué tres piedras/paneles con petroglifos faltan en su lista de Lúcumar? ¿Es posible que yo tenga una mejor experiencia/experticia en el campo? 2) ¿Por qué Castillo ha publicado un trabajo sobre Simbal (2009) en que algunos dibujos de petroglifos de Lúcumar no son correctos? ¿Es posible que yo tengo una mejor experiencia/experticia en hacer dibujos? ¿Castillo necesita dibujos o fotografías o información addicional? En mi trabajo de Simbal (2014) hay una dirección de correo electrónico: alguien me puede pedir información adicional. También Castillo podrá solicitar fácilmente a través de correo electrónico para obtener información adicional, en lugar de atacarme inapropiadamente y en público. Además, el neologismo “MSC-Style” es de hecho un acrónimo que no está mal definida, como dice Castillo. 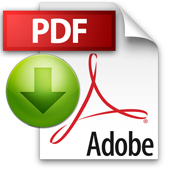 He escrito un libro de 221 paginas con 174 illustraciones para definir y acalarar el acrónimo (Van Hoek 2011). ¿Por qué es necesario para Castillo para usar tales palabras negativas y oraciones que considero como un ataque personal (porque ellos no tienen nada que ver con el contenido de mi papel)? Cuarto: ¿Y por qué es necesario para Castillo utilizar tales palabras y frases negativas que considero como un ataque a mi persona (porque estas palabras y frases no tienen nada que ver con el contenido de mi papel)? Ejemplos: herejía; risible; falta de formación; el autor se arroga facultades divinas; acosar por mail a investigadores; acosar por mail a universidades; acosar por mail a editores; reclamando información inédita, que está en prensa o en proceso de elaboración. Acosar (molestar, atufar, crispar, desagradar, disgustar, encalabrinar, encocorar, enfadar, enojar, exacerbar, exasperar, fastidiar, hartar, hostigar, impacientar, indignar, irritar, provocar a) es un palabra impropia de Castillo. ¿Por qué? Porque siempre he pedido informacion cortésmente. Sobre todo la ultima acusación de Castillo a mi persona es falsa y una decepción: Nunca he reclamado información inédita; siempre he pedido información cortésmente y nunca he usado (a sabiendas) información inédita sin permiso personal del autor. Las últimas palabras: también es fácil para Castillo poner -de una manera negativa- las cosas fuera del contexto. Un ejemplo pungente: Castillo ha escrito en su réplica: Sostener como afirma Van Hoek que la Dra. Rocchietti desconoce la iconografía del formativo o del período intermedio temprano, es una herejía que no merece mayor comentario. Con esta frase Castillo afirma que yo insisto en que la Dra. Rocchietti no esté familiarizada con la iconografía del Período Formativo o el Período Intermedio Temprano. Esta réplica de Castillo es completamente falsa. ¿Por qué? ¡Porque Castillo usa una frase incompleta! ¡Nunca he “afirmado/escrito” que la Dra. Rocchietti desconoce la iconografía del formativo o del período intermedio temprano! Most likely she was not aware of the Formative Period imagery on Boulder LUC-008 and on the Piedra la Paloma. Also the probably Early Intermediate Period imagery on many of the others stones in the Simbal area was unknown to her. Muy probablemente ella desconocía la iconografía del Periodo Formativo en el soporte LUC-008 y en la Piedra de la Paloma. También la probable iconografía del Período Intermedio Temprano en muchas de las otras piedras en el área de Simbal eran desconocidas para ella. Cualquier lector imparcial debe admitir que la Dra. Rocchietti en su trabajo, sólo describe una pequeña parte de los grabados de Lúcumar y no demuestra haber visto los grabados formativos en ese sitio. Por lo tanto, sus conclusiones se basan en una investigación incompleta. Por esta razón las últimas palabras en la réplica de Castillo son irrelevantes: No importan los méritos (muy apreciado para mi) de la Dra. Rocchietti en el Perú o Argentina (y de Lic. Castillo) en el réplica de Castillo. Por lo tanto, la palabra “herejía”, usado por Castillo, y todo su comentario es demasiado aguda, incorrecta y no colegiada. EN RUPESTREWEB BUSCAMOS DISCUTIR LAS IDEAS, NO JUZGAR A LAS PERSONAS (Fuente: https://espanol.groups.yahoo.com/neo/groups/rupestreweb/conversations/messages/13827). Because of the unjust criticism (link) by archaeologist Daniel Castillo Benites on this paper, I decided - in 2015 - to produce a short video about the petroglyph sites near Simbal, focussing on two sites in the valley of the Sinsicap river: Lúcumar and Cerro Prieto. This YouTube video is an addition to my replica (link) to Castillo Benites who never had the courtesy to reply to my replica. Therefore I invite archaeologist Daniel Castillo Benites to objectively and scientifically comment on my replica and on this video as well and submit his comments to Rupestreweb Messages.